I was in a pinch this year to get my presents wrapped and out the door (but, of course, didn’t want to settle for run of the mill wrapping paper since my handmade gifts certainly weren’t run of the mill). I dug through my gift wrapping box and found some adorable paper that I could use to coordinate my entire ensemble of gifts. 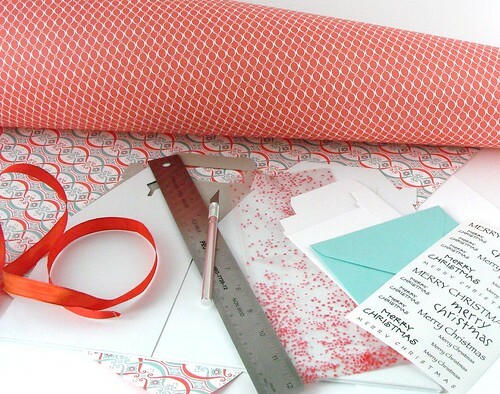 This project works with any sort of wrapping paper and looks incredible. Just don’t tell anyone how easy it was! SEA SALTS: Bath salts are an easy gift with simple ingredients. I just mixed 3 cups of Dead Sea Salt with 2 ml of diluted Blue Mix Labcolor and 10 ml of Cranberry Fig Fragrance Oil. Just mix them well and they’re ready to give away. For the packaging, scoop the salt into a cellophane bag and fold down the top. 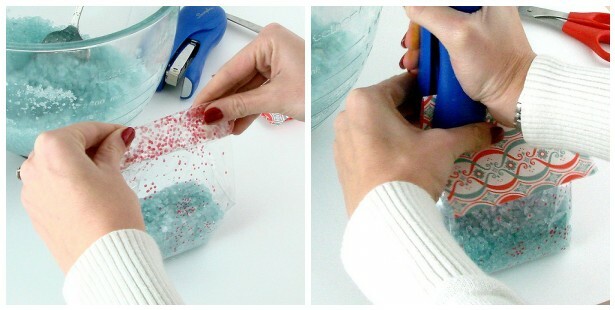 Fold a piece of wrapping paper over the top and staple on both ends. PAPER LUNCH BOX: I found these cute little lunch boxes on sale at a local craft store and they’ve been in storage waiting to be used. To snaz them up, I cut a 4 inch wide strip of wrapping paper, wrapped it around the box and secured it with clear tape. SOAP BOX: Our plain white soap boxes are blank canvases for creativity. Above, I cut two strips of paper and wrapped them around the soap box in opposite directions, securing the ends with clear tape. The paper I used is double sided but you could use 2 different, coordinating pieces of paper as well. Check out our Finished Cold Process Soap if you don’t have time to make your own. CARDS: My cards turned out so cute that I had to make extras to keep on hand. 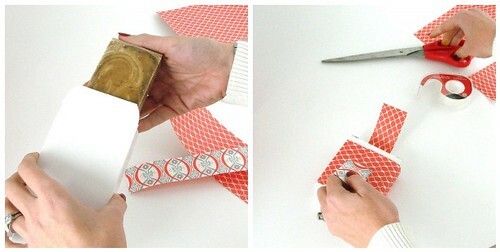 With a glue stick, adhere a strip of paper over the blank card. For an extra special touch, I added a Merry Christmas Sticker to the bottom that I got at my local rubber stamping store (so much faster than rubber stamping). Trim the edges of the card and you’re done with the card. Pack your goodies in the lunch box, close up the box and your present will hold its own under any tree! Looks so cute, thank you! Wow, simple ideas that look fabulous! You've done it again Anne-Marie! I am envious of what you can do from simple things and make them extravagant! Those are so elegant! Thanks for sharing such great tips. Simple, yet elegant – LOVE it!! Great tips! OMG, this is so awesome and inspiring! Thank you so much for these great, simple tips! Such great ideas to dress up your packaging – love it! i love it!! the soap box is my fav, because i think it changed and just looked wonderful for hardly nothing!!! xoxo merry christmas!! just beautiful anne-marie!! (very martha stewart… and yes, that's a compliment!). i love the color combination of that salmon-like color, light turquoise blue and the white. very festive without using boring regular x-mas green & red. Ok, I think I now have a new obsession. 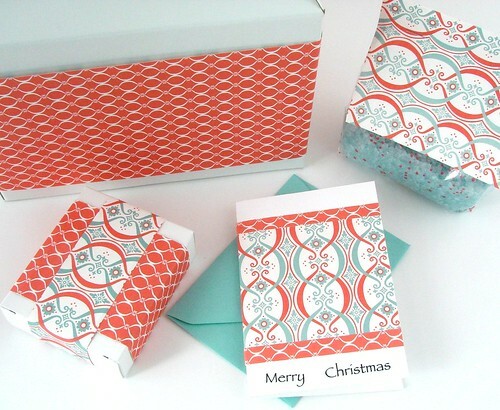 The letterpress cards and papers are just beautiful. I was looking for a new way to package my soaps in the new year and I think this may be it. Those are too adorable for words! You always have such cute coordinating ideas! I love how fresh and joyful they Always look! I never think about using those colors together but they really pop! wow am! I was especially glad to see how you packaged the salts! I'm thinking of doing my regular packaging that way! Just print the info on paper and staple away! AMAZING!! !